Dying to Be Men explains why men and boys are at greater risk of serious disease, injury and death than women and girls, and what needs to be done to change that. Based on scientific findings from a diverse range of fields, including extensive medical studies and new research by the author, the book demonstrates that there is nothing “natural” about men dying more than five years younger than women. Referencing over 2,000 studies, this book identifies 31 key differences between women and men that account for why men are more likely to die from all 10 leading causes of death. Health behaviors are among these differences and the book identifies over 50 specific behaviors that increase the risks of men and boys. Courtenay explains that this problem is not simply men “behaving badly,” but in fact, they are behaving exactly the way they are expected to behave. 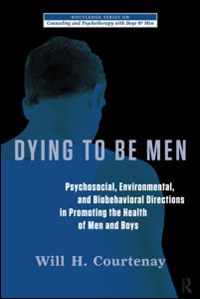 Dying to Be Men shows how society encourages the attitudes, beliefs, and behaviors in boys and men that are linked with increased health risks. Society teaches boys that they should not need help or worry about safety, risking danger is manly, getting hurt is inevitable, and that they are invincible. Despite boys’ greater risks, parents are less concerned about the safety of their sons than their daughters, actively discourage boys from seeking help and often punish them when they do, handle boys more roughly, expose them to more violence, and misperceive them to be stronger and less fragile than girls. All of which contribute to why boys mature into unhealthy men. In explaining men and boys’ risks, the book illustrtes how masculinity directly influences men’s health: The more traditional a man’s beliefs about manhood, the greater his health risks. But masculinity does not just influence men; it pervades our culture and the institutions men participate in. Courtenay shows how cultural myths about manhood contribute to why most men think their health is “very good” and better than women’s. Courtenay also explains why certain men, like African American and Latino men, young men, and rural men, are at greatest risk. Perhaps most importantly, Courtenay shows how to help men and boys live longer, healthier lives by outlining best practices to improve men’s health in a Six-Point H.E.A.L.T.H. Plan (Humanize, Educate, Assume the Worst, Locate Support, Tailor A Plan, Harness Strengths), which includes detailed strategies for improving the health of men and boys.